HEBOU PNG Barramundis’ fast bowler, Nosiana Pokana was selected to play his first international match for PNG last Saturday 6th February, 2016 when PNG took on Ireland in the First T20 International (T20I) match at Tony Ireland Stadium. Former PNG Barramundis batsmen, and current Cricket PNG Selector, Taunao Vai presented Pokana with his own “Baggy Black” Cap prior to the match, becoming the 114th Papua New Guinean to represent the country at senior level. “I was out of words when I received the (Baggy Black) Cap. It was a fantasy for me from when I started playing cricket. I must thank God for the Baggy. I am so humbled to have the baggy black ,” said an elated Pokana after the match. Pokana from Kalo Village in Central Province went to school at Port Moresby Grammar School. He plays for the Hoods Cricket Club in the Port Moresby Cricket Association (POMCA) alongside HEBOU PNG Barramundis’ star batsmen Assad Vala and young all-rounder, Hiri Hiri. Pokana is currently on a Scholarship playing with the Wanderers Cricket Club in the Townsville Cricket Association (TCA). 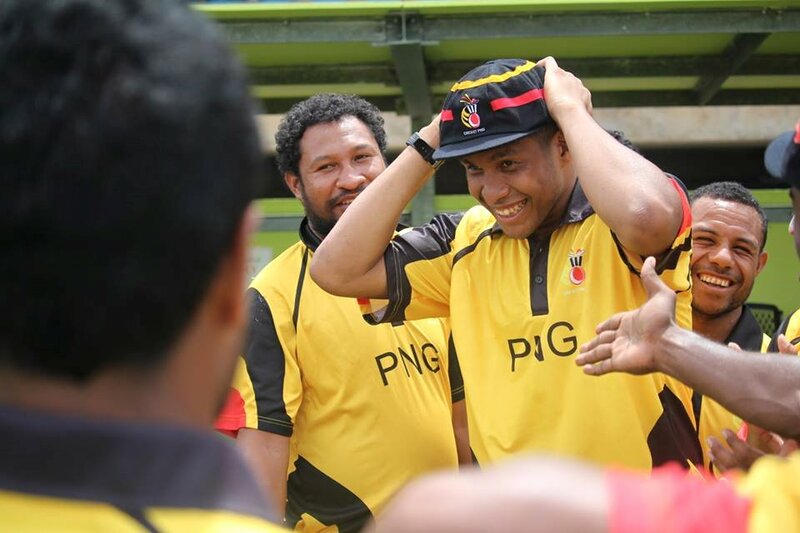 Pokana has already represented PNG at the Under 17 Level (Ghekkos), Under 19 Level (Garamuts) and PNG “A” Level. “My ultimate dream is for the HEBOU PNG Barramundis qualify for a world cup. I am sure that we can get there. I must thank my role model, my Dad for getting me here. Without his wisdom I wouldn’t have come this far,” concluded Pokana. Pokana and the HEBOU PNG Barramundis will be taking the field tomorrow where they will be taking on Ireland in their third and final T20I in Townsville. Ireland currently leads the three match series 2-0.